"She made so many people happy," says Gidget's trainer, Sue Chipperton.... The mostly retired actor lived out her days laying in the sun – "I like to joke that it's like looking after a plant," says Chipperton – and entertaining at shoots when her trainer brought her along. "Gidget," says Chipperton, "always knew where the camera was." Of course the whole campaign traded in stereotypes — imagine the pitch: "Like Speedy Gonzalez but a dog! Who talks!" — see the commercials that promote a "taco revolución" or the one that presents the chihuahua as a Latin American revolutionary figure in "Viva Gorditas." Although the campaign was sort of a failure, in that "[d]uring the Chihuahua era, 1997 to 2000, Taco Bell sales slipped," nevertheless it was a pop culture phenomenon, with a catchphrase up there with "Wazzup!" and "Where's the Beef?" 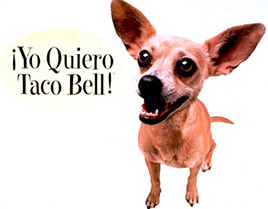 Oh no, did the Taco Bell dog ever get any Taco Bell? Or is it like a Wile E. Coyote situation, want but cannot have. Surprised they never made a Che Guevara / Taco Bell ad. Is there going to an autopsy? Why is TMZ not reporting on this??? Amy, I think it's more like the Trix Rabbit... Silly Dog, Taco Bell is NOT FOR YOU!!! !